Antoniadi crater, which shows a dark and smooth mare deposit on its floor. Crater counting was performed for the area outlined by the white polygon. Volcanic activity on the far side of the earth's moon may have lasted longer than previously thought, recent images from a Japanese lunar satellite suggest. The finding, detailed in the Nov. 7 issue of the journal Science, could help shed light on the moon's formation and evolution. Scientists think that the moon formed when a rogue planet about the size of Mars crashed into Earth and ripped out a chunk of the planet's molten mantle. Some of the material from that chunk began to orbit Earth, gradually cooling over millions of years to form the moon. The lunar surface is dead now, but over the millions of intervening years since it formed, it experienced bouts of volcanic activity. Scientists have studied lunar volcanic features, the most common of which are mare (dark "seas") basalts, from orbit to determine when they formed. Radiogenic dating is the best way to date mineral deposits, but samples from the moon's surface are limited, and come only from a few locations on the moon's nearside. Another way to estimate the age of volcanic features is to count the number of impact craters they have: the younger the feature, the fewer the craters that mark its surface. 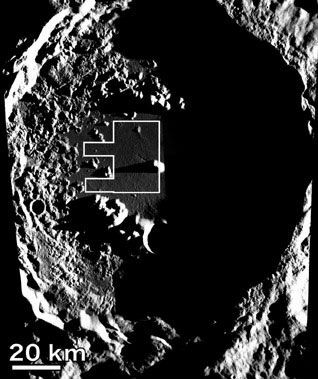 A group of researchers did just that for two areas on the far side of the moon, the South Pole-Aitken (SPA) basin and Mare Moscoviense, with images from the Terrain Camera aboard the Japanese polar lunar orbiter SELENE (KAGUYA). The orbiter launched on Sept. 14, 2007, and began its mission observing the moon's surface on Dec. 21. Most mare volcanism ceased on the moon's far side about 3 billion years ago, but at a few locations, Junichi Haruyama of the Japan Aerospace Exploration Agency and his colleagues estimated that mare deposits were only about 2.5 billion years old, suggesting that some episodic volcanism continued after the main thrust had ended. Volcanism also continued on the nearside, apparently lasting longer than on the far side, the researchers found. In Oceanus Procellarum, for example, basalts have been estimated to be a young 1 billion years old. The difference in the termination of volcanic activity on the two sides of the moon could be related to a thicker crust on the far side, or fewer heat-producing radioactive elements on the far side compared to the near side, the authors said.